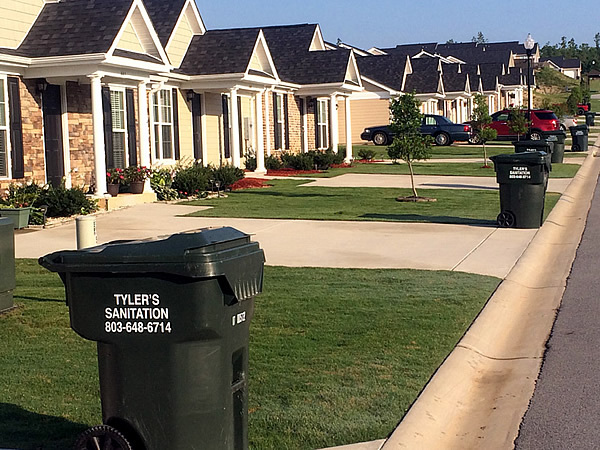 Tyler’s is Aiken’s largest and most dependable residential waste collection service. Our multi-truck, late model fleet ensures safety, cleanliness and dependability that you deserve. Simply put, our trucks arrive on time — every time. Place cart on the curb the night before your scheduled pick-up. No paint, varnishes, motor oil, car batteries, tires and/or contaminated or hazardous chemicals in your cart please! Local landfill regulations prohibit Tyler’s Sanitation from picking up yard waste, household appliances, or furniture. Tyler’s Sanitation will pick up on your regular schedule days with the exception of Thanksgiving, Christmas and New Year’s Day. We Always Appreciate Your Business! Pay your bill On-time Every Month!Set Up Auto Payments and Forget about your bill! Sign Up today for Automatic Bill Payment! If you have any questions or comments, please feel free to contact us. We look forward to serving you!